The perfect meal begins with the freshest ingredients. 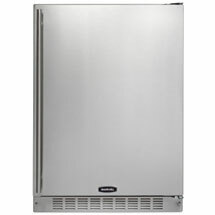 And long-lasting freshness is what Marvel’s refrigerated drawers are all about. Now with our exclusive Sentry System™ refrigeration monitor, you have the controls at your fingertips to ensure your food is fresh and properly preserved. The Sentry System™ operates in real time to actively maintain optimal preservation conditions. It also monitors critical components, including over/under temperature, drawer ajar and power failure conditions. With the largest usable capacity on the market, Marvel’s refrigerated drawers incorporate white interiors, which are both beautiful and provide the perfect environment for fresh food storage. All models have full extension slides that give full access from above, with everything in view and within easy reach. And you will appreciate the Marvel exclusive extra deep bottom drawers, which allow two-liter and opened wine bottles to be stored vertically. Options include drawer dividers and the E-Z Stor Storage System, which makes fresh food organization a work of art. 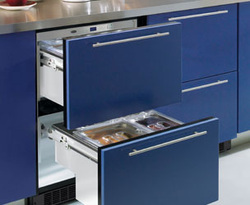 And only Marvel has both 24” and 30” width drawers to give you options in capacity and design. Exclusive Sentry System™ Refrigeration Monitor The Marvel Sentry System™ refrigeration monitor operates in real time to actively maintain optimal preservation conditions. Many systems monitor cabinet air temperature and cycle on and off to meet the set point, creating a volatile environment. Our system uses intuitive controls to predict temperature based on demand. As a result, it engages the cooling system to make adjustments in temperatures, creating a more stable environment. 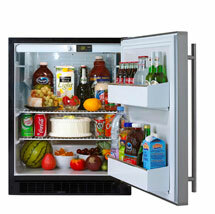 The Marvel Sentry System™ is your peace of mind that your fresh foods are properly preserved. The 6OBARM-SS-F provides storage for wines and other beverages, all in one elegant, stainless steel clad model. Split top shelf design allows easy access to canned beverages on the left side and large bottle storage on the right side. Perfect for storing open bottles. 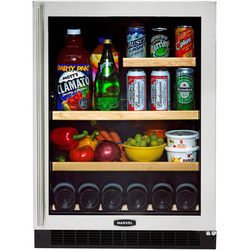 The new 6GARM glass door all refrigerator and beverage center stores beverages and perishable fresh food with the temperatures ranging from 35°F to 43°F. The cantilever shelving system is flexible and allows 1.5” increments of height adjustment and is easily removed for cleaning. The half-shelf design allows vertical storage of tall items and moves to either side making it perfect for storing open bottles. 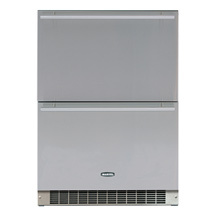 The forced air feature keeps the temperature even, resulting in quieter operation and improves the efficiency. 5.6 cu. ft. storage capacity. Cantilever style shelving system with 2 full-width and 1 half-width shelves. All shelves have removable glass inserts for easy cleaning. Shelf height positions can be adjusted in 1 ½” increments. Full-width shelves can be converted to 6-bottle wine shelf by removing glass insert. Fixed position 6-bottle wine cradle located at bottom of compartment. Forced-air compartment cooling to minimize temperature gradients and reduce “pull-down” and “recovery” times. Electronic temperature control with exclusive MicroSentry™ refrigeration monitor. Discretely located control panel with Amber LED temperature display. “Close Door Assist” hinging system. Right or Left hand door swing specific, (not field reversible). Tinted, dual-pane, UV resistant glass door. Display lighting option on glass door models. Color coordinated full length handle. Overlay panel door available on both glass and solid door models to accommodate custom panels. Natural finish Maple shelf fronts may be painted or stained. Durable powder painted finish on cabinet and painted doors. Cabinet finish suitable for free-standing installations. Refrigeration system design is “built-in” capable. Height can be increased 1” with factory installed leveling legs. 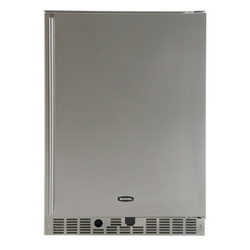 With an impressive 5.3 cubic foot capacity, the 24" ADA Height Refrigerator manages to fit in all the features and quality of the top models in the Marvel lineup, and fit them elegantly into an ADA-compliant configuration - fits under 32" height ADA cabinet height specification. *Levelling legs allow upward height adjustment. See Owner's Guide for more details. Featuring a unique half-shelf to allow vertical storage of 2-liter and opened wine bottles on lower rack, plus wide shelves to hold platters and plenty of beverages, this model is ideal for outdoor entertaining. Exclusive MicroSentry™ refrigeration monitor has a visual and audible alarm to alert you if the door is left ajar or if the temperature goes above or below the set temperature for an extended period of time. High performance stainless steel exterior sides, top and full wrap door.